Ok these are just some simple recolors I created the other day, they are nothing spectualar but I figured I might as well share them with you all. I hope some of you like them. These are formal dresses that are perfect for that holiday party. 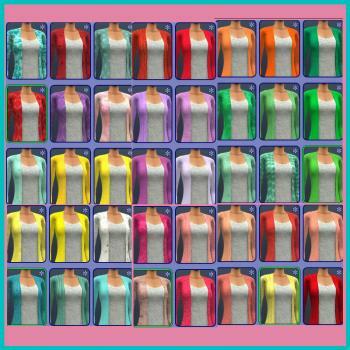 It is a custom mesh, and the dresses are enabled for young adult, adult, and elder. The mesh is included. There are separate downloads for the green dress, the gold dress, and then there is a combo download for both of them. I used a mesh I got from here. Although the mesh isn't Skellington's it was included with a download of recolors Skell made. I have no idea where the original mesh came from originally, I am sorry. Someone named Pinketamine made a shoe swap of Geldyh's prom dress. 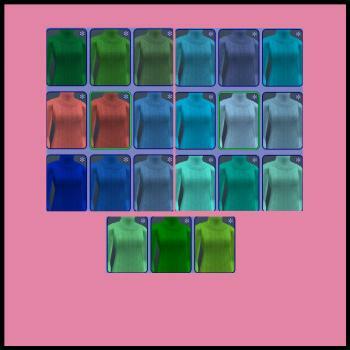 Made with Sims 2 Ultimate Collection bodyshop. Here is another of my favourite creators, MDP. She does some amazing things and you really should visit her site. This is called the "cinnamon blouse" and I think it is quite elegant looking. 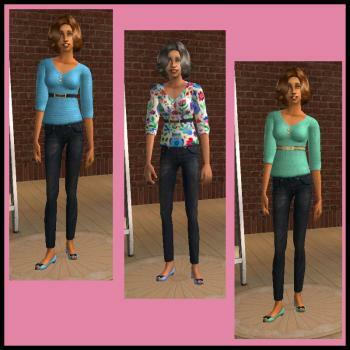 I have The Sims2 Ultimate Collection and these were made using that version of Body Shop. All the recolours are also elder enabled, meaning they will show up in both the adult and elder categories of your game. I am such a fan of DeeDee sims. Here is another one of her lovely creations, a nightgown for our ladies. As with all my adult clothing, this has been elder enabled meaning it will show up in both the adult and elder categories of your game. 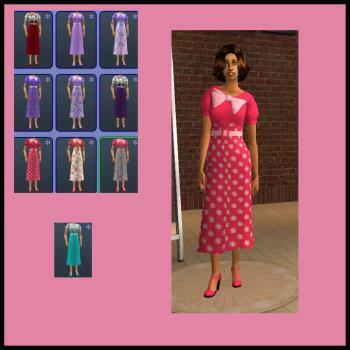 I have The Sims2 Ultimate collection and these nightgowns were made using that Body Shop. This is another 4t2 conversion by MDP. I am a huge fan of her conversions and this blazer is just too cute. It pairs with any bottoms beautifully and just looks classy and sharp! As with all my AF clothing uploads, these have been elder enabled. This means it will show up in both the Adult and the Elder categories of your game. 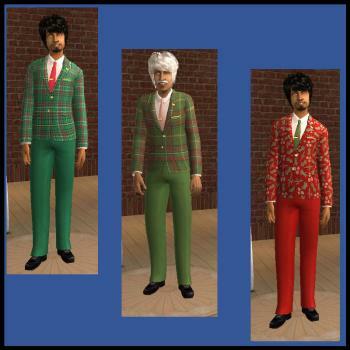 I have all the expansion and stuff packs and these blazers were made using Mansions & Garden's Body Shop. This is a lovely little skirt that had the added bonus of coming with shoe choices. I am partial to Bunhead's peeptoes so these were made with that particular shoe. 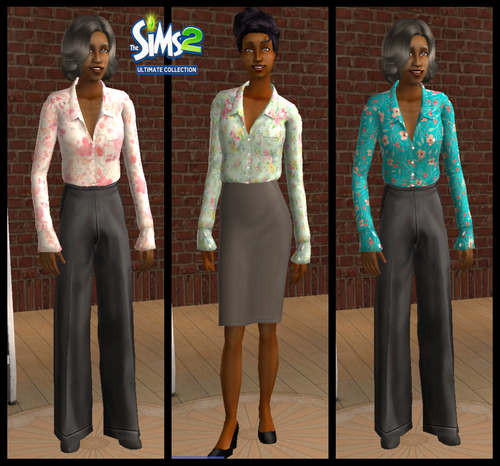 As with all my adult female clothing, these have been elder enabled, meaning they will show up in both the adult and elder categories of your game. I have all the expansion and stuff packs and these were made using Mansions & Garden's Body Shop. are absolutely divine. I saw them and just had to have them. As with all my adult clothing uploads, these have been elder enabled, meaning that they will show up in both the elder and adult categories of your game. The mesh file includes a texture file that HAS to be included or recolours will not show. 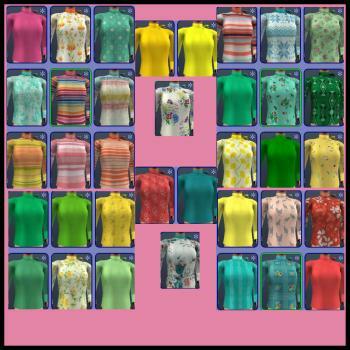 As with all my adult clothing uploads, these have been elder enabled meaning they will show up in both the adult and elder category of your game. In my search for teen female clothing, I completely overlooked that this beautiful dress also had an adult mesh. These recolours would not exist if it were not for Gayars. If you have not visited DeeDeeSims I urge you to go there. She has wonderous clothing and some other stuff as well. I have all the expansion and stuff packs, and these recolours were made using Mansion & Garden's Body shop. Please note--This is Part 1 of a 2 part multi-generational project. This is a lovely little blouse by Bunhead with a bow at the neck which gives this blouse a very pretty detail. Since the original link goes to a dead box link for those of us using desktop computers, I have provided Bunhead's original file AND I elder enabled all of her original recolours. As with all my adult female uploads, these have been elder enabled, meaning they will show up in both the adult and elder categories of your game. I have all the expansion and stuff packs and these were made using Mansions and Garden's Body Shop. Have a blessed and joyous Easter everyone! I've had this dress for quite a while and finally got around to finishing it. 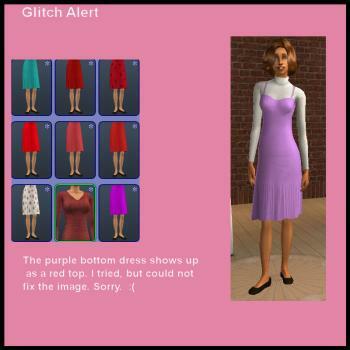 Since the link for this dress is a dead box link, I have uploaded Bunhead's original file with her recolours, the only difference is that I also elder enabled her recolours. 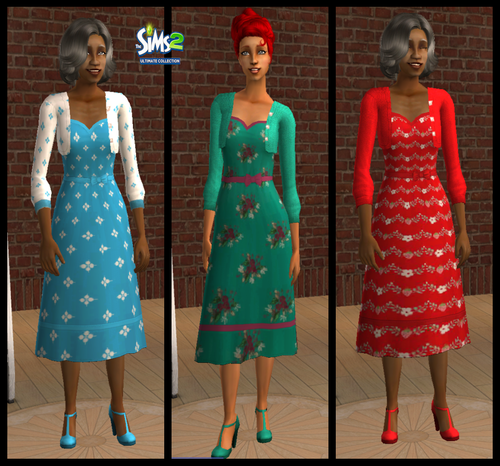 As with all my adult female clothing recolours, these are elder enabled meaning they will show up in both the adult and elder categories of your game. I have all the expansion and stuff packs, and these were made using Mansion & Garden's Body Shop. I have this thing for shoes and I love these peep toe shoes. I'm also a huge fan of anything by Bunhead, so when I saw these I had to have them. The link for these pants goes to a dead box link, so I have also uploaded the original file with Bunheads recolours. I also elder enabled her recolours. As with all my adult clothing, these have been elder enabled meaning they will show up in both the adult and elder categories of your game. I have all the expansion and stuff packs, and these were made using Mansions & Garden's Body Shop. I will also be uploading the teen version of these pants very soon. This is that fabulous blazer made by Bunhead. I LOVE this blazer so much. It's casual and classy at the same time. I will be uploading the teen version of this blazer very soon. This is a multi-generational project. It contains Bunhead's WingTop, that also has a mesh conversion for teens. In order for the teen recolours to show up, you have to have the adult files as well. I don't know how to undo that, so I made the colours for the teens, adults and elders all the same. I have included the AF files from Bunhead in a separate rar but I elder enabled her recolours. The link to her file is a dead box-link which is why I have uploaded it here. Trapping made the teen conversion. YIPES!! I forgot to mention something, this top is not suitable with short shorts or skirts as part of the botton sticks through. But I like it so much that I made more colours anyway. As with all my adult clothing uploads, these have been elder enabled, meaning they will show up in both the adult and elder categories of your game. They have so many pretty things at GoS and this is another one of their pretty tops. With lower waisted clothing, this top has a lovely kind of ruffle and then when you have higher waisted clothing, the top gets tucked in without bits sticking through. Another one of CatofEvilGenius beautiful tops. The link is for her Mini Site at MTS. I was going to do just knits, but then I decided to have a little fun and make an assortment. I really like this dress and it turns out beautifully with an assortment of patterns, prints, plain and knits. Even plaids didn't get stretched. This was another dress I saw and liked but not the boots that went with it. So I took two bottom dresses textures and combined them to get the one I wanted.I pasted the one dress texture I wanted, on the one that had the shoes I wanted and it actually worked. This shows up in the everyday, bottom section of the adult clothing. Not all of the tops in game will work with this dress bottom. This is actually the dress where I saw that Stalj blouse which fueled my hunt for that blouse. These two projects taught me a new skill and I learned the hard and funny way when you change something you also have to change the alpha file. It looks pretty darn funny if you don't change that alpha file. 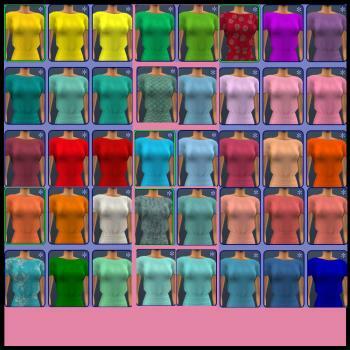 As with all my female adult clothing uploads, these have been elder enabled, meaning they will show up in both the adult and elder categories of your game. So many places I went I saw this blouse and I wanted it so bad, but it wasn't to be found anywhere. Turns out it was actually part of a complete outfit and someone had separated it, but since that was done, that creator left and the blouse disappeared. I finally found a version of it, so I tinkered around and almost had it at one point, but it wasn't quite right so I set it aside for later tinkering. Finally I went back to it, tinkered and tinkered until I got what I wanted and here it is. One of the things I changed was to make the blouse a wee bit longer so it could be worn with any bottom and the midriff would be covered. This is Part 2 of a 6 Part Set. 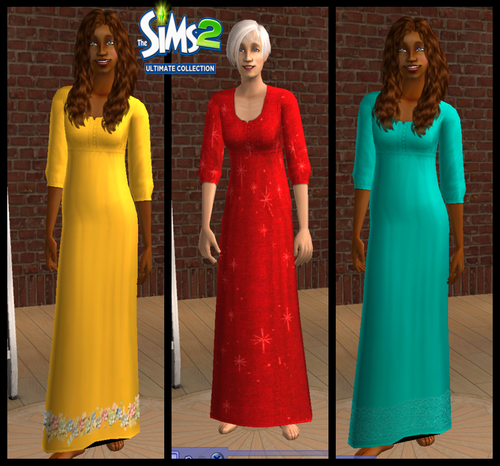 These are the adult and elder female dresses made to compliment the male set posted HERE. 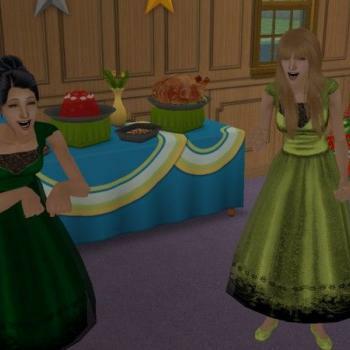 If your Sims are hosting a New Year's Eve party, these dresses all have a matching counterpart with the adult male and elder male that has also been uploaded as Part 1. This particular dress also has a teen version that REQUIRES the adult files in order for the teen files to show up. The next upload will be those matching Teen female dresses. This upload contains the MESH FOR BOTH. As with all my adult clothing uploads, these have been elder enabled, meaning they will show in both the adult and elder categories of your game. I tried very hard to hold this until New Year's Eve, but I just couldn't. This is a 6 Part Set and this is Part 1. I have all the expansion and stuff packs and these were made with Mansions & Garden's Body Shop. I have always loved this dress but it only came in one colour. Now I have too many to choose from. Sometimes nothing is quite as warm and cozy as a big wool sweater. When the winter chills sneak in, this is the perfect sweater to keep them away. I have all the expansion and stuff packs and these were made using Mansion & Garden's Body Shop. These are just base game undies that I wanted more colours for. I actually like these undies as I find them to be modest and not overly decorated. Since they are base game undies, no mesh is required.